Honestly! I swear I hadn’t planned on this week being a theme week but some how 3 of the 4 blog posts I shared this week contained radishes! I guess since radishes are in season RIGHT NOW and have been at rock bottom prices, I have been gobbling them up like crazy! 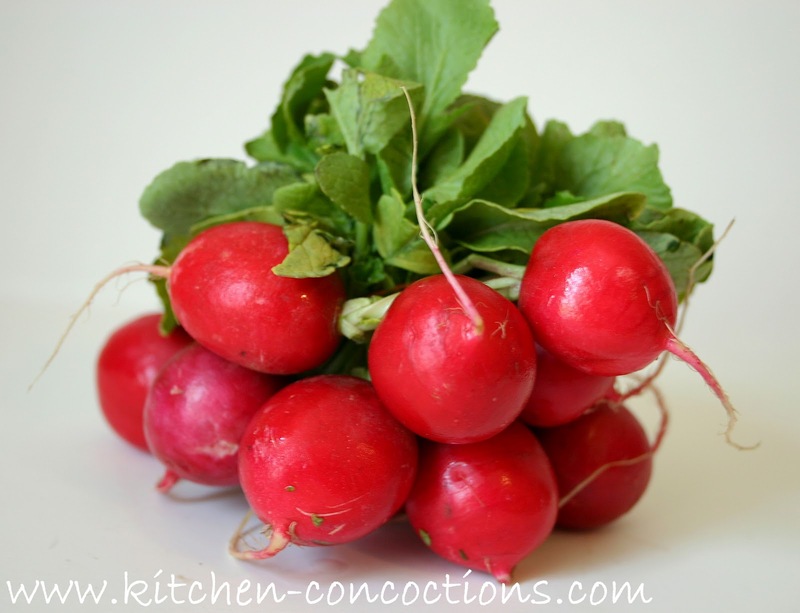 Below is an article I wrote for meal planning/recipe site Food on the Table all about, you guessed it, radishes. Check out all the great information, tips, tricks and of course recipes involving this ruby red root veg! Spring is here and it is the perfect time to rediscover ruby-red radishes. Radishes, although available year round, are fresh and in season from April through October. Along with cabbage and cauliflower, radishes are a member of the Brassica family. Radishes mature very quickly and only take three to four weeks from planting to harvesting. Radishes are a root vegetable with a crisp texture and slightly peppery flavor. Spring radishes are much milder than late summer radishes which tend to have a sharper bite. The most popular radishes are small red skinned, turnip shaped vegetables, which are sometimes called Cherry Belle. However, radishes come in many different shapes and sizes. Other common varieties of radishes include Black Radishes, Daikon Radishes, Watermelon Radishes, and of course Horseradish. 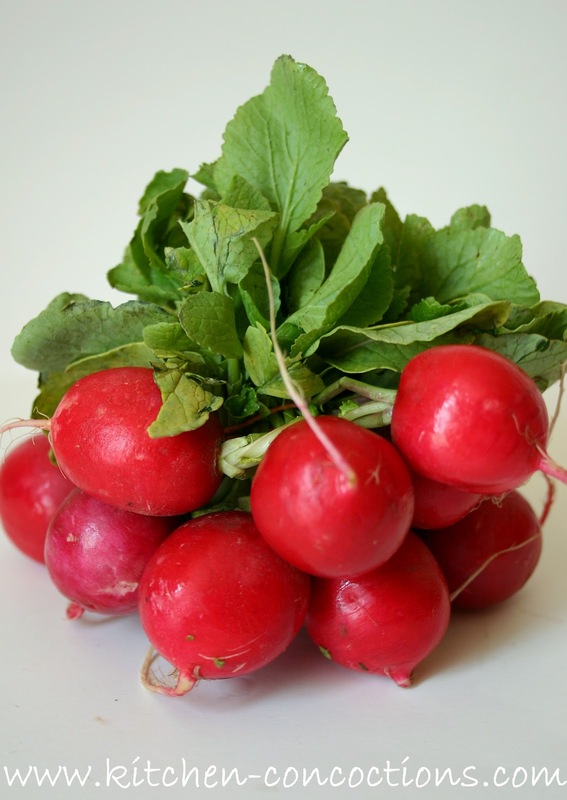 Radishes are an extremely low fat, low calorie food. They are cholesterol free and are a great source of Vitamin C and folic acid. When purchasing radishes, choose radishes that are firm with the leaves still attached. Avoid radishes with cracks and bruises or wilted leaves, as this is a sign of mealy radishes. Once home, remove the green tops and store radishes in a plastic bag in the vegetable drawer of the refrigerator. If stored properly, radishes should keep for about one week. However, if radishes become slightly soft after a few days, crisp them by placing them in a bowl of ice water for one hour before serving. Both the radish root and green leaves can be consumed. The greens have a mild flavor and can be wilted like other leafy greens, added to soups or eaten raw in salads. The radish roots can be eaten raw as a snack or added to salads, sandwiches, slaws, or wraps for a nice crunch. Radish roots can also be cooked or braised with other vegetables for a nice earthy element.